Friday March 8 is International Women’s Day, an annual event recognised across the world celebrating and supporting the women's rights movement. The first gathering was in 1911 in the US, and since then it has grown into an international festival of marches, demonstrations, celebrations and ideas. Here’s a look at how the day is being recognised across Europe. A call for a strike on March 8 was launched by a collective of feminist associations, trade unions and more generalist political movements. It is called 'March 8, 3:40pm, time to settle the score', with the campaign claiming women work for free from 3:40pm every day due to the gender pay gap. "We represent 52% of the French population. Our salary is 26% lower than that of men. As a result, from 3:40 p.m., we work for free," explained the organisers, who have asked people to wear a purple scarf. Emmanuel Macron will also award the first "Simone Veil Prize of the French Republic". It will be a reward for actions taken "all over the world in favour of women's rights", according to Marlène Schiappa, French Secretary of Equality between women and men. In Berlin, the organisation "Frauen*kampftag" has called for a protest, with the slogan "celebrating, striking, keep on fighting". It has been initiated by several women's organisations and the political party DIE LINKE. This year, Berlin, a federal state of Germany as well as the capital, voted for March 8 to be an officially recognised public holiday. A feminist strike has been called by the movement "Non Una di Meno", or "Not one less". The event calls for strikes in places of work, homes, school, hospitals and public spaces, with the organisers saying "we cross our arms and reject gender roles and hierarchies". The strike has been called in protest against "the patriarchal and racist violence of neoliberal society" according to the event website. London hosts a large number of events, including the Women of the World festival, with appearances from political activists such as Angela Davis and Naomi Klein. 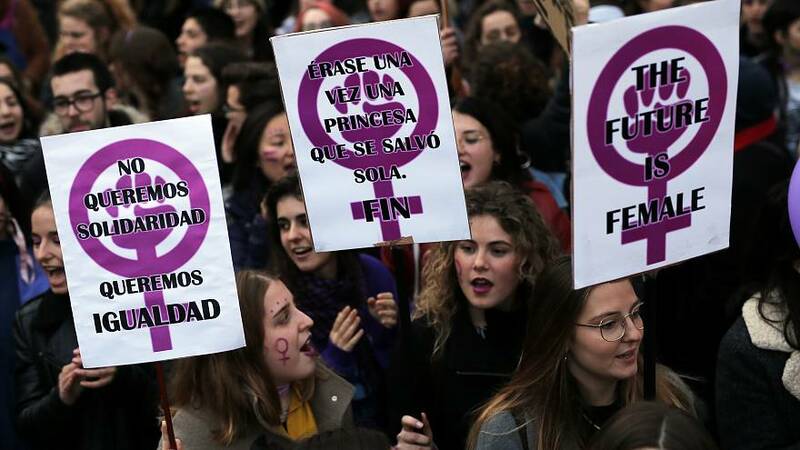 After almost 6 million people took part in Spain's first feminist strike last year, the event will again be held on Friday March 8. Different feminist organisations have called again for a 24-hour general strike. The main Spanish unions, CCOO and UGT, have backed it by asking for strikes of at least two hours per shift. In addition there are have been demonstrations called in the main Spanish cities. The manifesto calls for people to stand up "against a patriarchal justice", probably in reference to cases such as the 'Wolf-pack' one. International Women's Day is an official public holiday in Russia, along with a number of republics from the former USSR. The International Women's Day website has a list of official events across Europe - and the rest of the world. You can search for the events by specific city, and sign up, get more information, or even organise your own event.